For some, simply a trip to the Disney Parks is a splurge, but for those who want to do more, this month’s Blogorail Blue Loop is sharing fun ways to splurge at Disney. At a price between $400 and $600 per hour, a Private Premium VIP Tour at Walt Disney World or Disneyland Resort VIP Tour is probably one of the ultimate splurges at the Disney Parks. Many assume that one must be rich or famous or both to take advantage of these services, but that is not the case. There are ways to make it more affordable as well as times it’s worth the expense and times it’s probably not. My family has used VIP services twice at Walt Disney World and once at Disneyland Resort, so we have first-hand knowledge about what’s included and what isn’t. 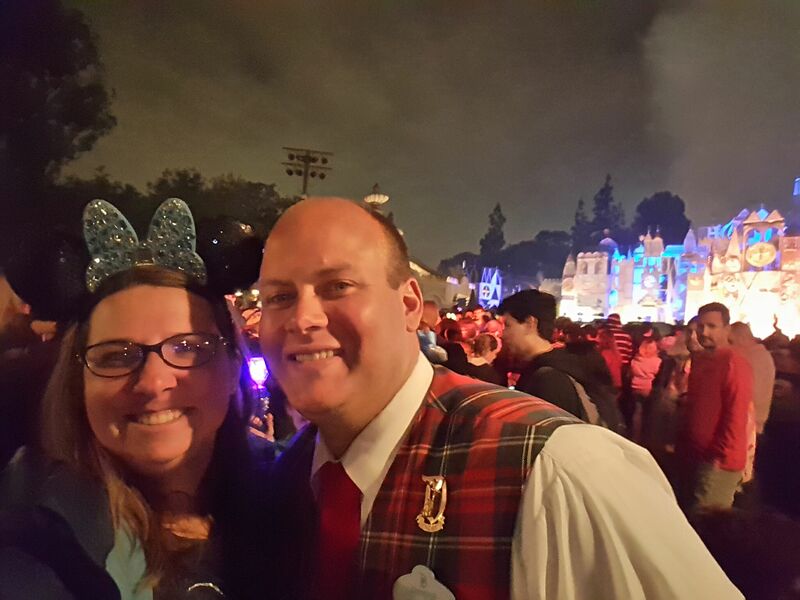 I had to have a selfie with our Disneyland VIP Tour guide who happened to be named Aaron, just like our one in Walt Disney World. First, think of it as an unlimited FastPass. For any attraction that has a FastPass line, the VIP guide will walk you to the line and remain in the line with you. It does not get you to the front of the line, only into the FastPass line where you will wait with everyone who has FastPasses. If you want to ride the attraction over and over, you will simply get into the FastPass line with your guide over and over. This does cut the wait time considerably, but there is still a short wait. Second, for attractions that don’t have a FastPass, the guide will take you into an alternate entrance to avoid the line. Usually, this is the through the exit. Again, there is a short wait, but it isn’t long. Another way a VIP Guide saves time is by knowing the fastest route from one attraction to another and having access to routes typical guests do not have. In addition, while Disney World Resort seems to have a more liberal policy about this than Disneyland Resort, the Guide can take guests backstage to avoid crowds and cut travel time. For example, we wanted to see Fantasmic! at Disney’s Hollywood Studios on the same night as Wishes and the Main Street Electrical Parade at Magic Kingdom. This was not impossible for our VIP Guide. After Fantasmic!, our guide escorted us backstage behind the stadium to a waiting van, no long walk to the park exit through the crowd for us. Then, he drove us to Tomorrowland at Magic Kingdom, again avoiding the entrance (and Ticket & Transportation Center) and crowds, had our magic bands scanned for entrance into the park, and walked us straight to a reserved area in plenty of time for Wishes. That simply would not have been possible without VIP. For even more time savings, VIP Tours include reserved seating for parades and shows. No more sitting on a curb for an hour or two before the parade saving a spot. We simply arrived 15-30 minutes early and a spot was open for us. At Disneyland Resort, one can have a reserved VIP spot at the evening shows and parades even if the VIP Tour ended earlier in the day. For us, this extended the six hour minimum since we used the six hours during the day and then added on the parade at night. At Walt Disney World, one can only have reserved seating during the tour so since we wanted to include the evening shows in our tour, we started it later in the day and either used FastPasses early in the day or just hung out in our resort. What about restaurants? VIP Services will make dining reservations for you if you ask them to, but they are subject to the same limitations as booking them on their own. At Walt Disney World, you have a choice as to whether or not your guide eats with you (Disney pays for their meal). We always chose to do that. Our guide became part of the family very quickly so we wanted him with us. At Disneyland, their meal was not included so we still included our guide with us and paid for it as well. I realize we didn’t have to, but we wanted to. Again, within a short period of time, the guide becomes part of the family so it would have felt odd to not pay for him. Unlike VIP tours at other theme parks I’ve been to, this is a fully private tour. The day is yours. If you want to spend all six hours riding the same attraction over and over, you can. If you want to try to hit all four parks at Walt Disney World, you can do that. The guide will simply take you where you want to go that fastest way possible walking from attraction to attraction when possible or driving from attraction to attraction or park to park as needed. Like all VIP tours, though, the guides are immensely knowledgeable and will give you tips to make the most of your days when not on the tour and may even share extra tips like where the high scoring targets are on Toy Story Midway Mania! or Buzz Lightyear’s Space Ranger Spin / Buzz Lightyear Astro Blasters. 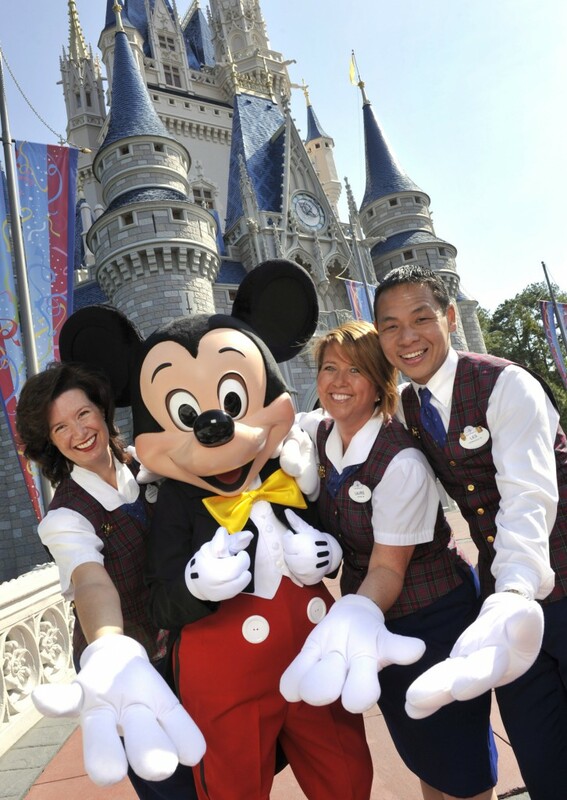 Disney Parks VIP Tour Guides – Photo courtesy of Walt Disney World News, copyright Disney. Oh, but the price. I know. $400-$600 per hour with a six hour minimum is tough to swallow, but it can be split with others. For example, the high end of the price from what I can tell is really only around the major holidays. Every time we’ve booked the tour, even in the summer, we were charged the lowest price. That now means we are at $2,400. That, though, is good for up to 10 people. Know some other families or couples going along? At $240 per person for six hours, that now brings the price more into the realm of VIP tours that aren’t private at other theme parks. Is it ever worth it? We don’t do a VIP tour every trip, obviously, but there are times that I save up for something extra special like special events or new attractions. For example, for Disneyland’s 60th Anniversary Celebration 24-hour event, I knew the parks were going to be very crowded so I booked VIP for my family, and I am so glad I did. The parks filled to capacity. The ONLY reason we were able to still go into the parks and from park to park was because our VIP guide took us through the security that closed the parks. In addition, we were able to avoid much of the crowd and still able to enjoy all the attractions. For me, it would have been a horrible trip to Disneyland if we were only able to enjoy a few attractions due to the very long lines or even worse, not even able to get into the parks. In addition, we had reserved seating on benches at the train station for the Paint the Night parade and fireworks, something we probably wouldn’t have seen otherwise. For an upcoming trip, I am planning to book VIP services so that I can comfortably view the new areas and shows at Disney’s Animal Kingdom. In other words, if the park is going to be super crowded, for us, it’s worth the extra money. Why spend all that money to travel to Walt Disney World or Disneyland Resort to simply be stuck in crowds and lines? This entry was posted in Disney - not travel, Disneyland Resort, Walt Disney Wednesday, Walt Disney World and tagged vip tour, walt disney world tours on February 15, 2017 by kim051172. This would be awesome but beyond my splurge limit! Thanks for the vicarious experience! Those are some very compelling reasons to book the VIP service! Sounds like a great way to maximize time. On my Dream Disney bucket list for sure! My family did our one and only VIP tour waaaay back in 2000. It was an experience my boys still talk about, as our guide introduced us to the world of Hidden Mickeys. And I mean EVERY single obscure one possible! We can’t get past the plates in the ballroom at the Haunted Mansion without reminiscing about her and that very grand experience. Your tip about splitting the cost between ten Guests is a good one. This is for sure the ultimate splurge Kimberly! Spending all day with a cast member sounds like so much fun! And I’m very impressed that you got to see Wishes & Fantasmic! on the same night!